Birds can pull out their feathers due to stress or health concerns. 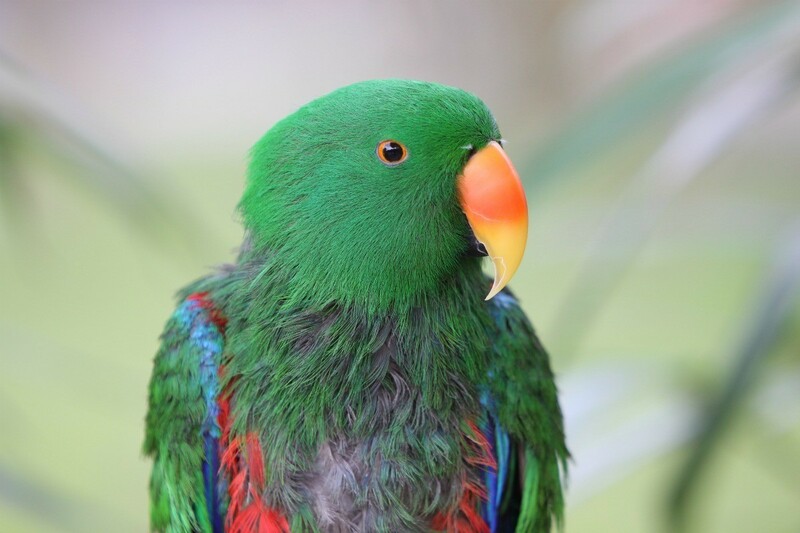 This is a guide with advice for an eclectus parrot pulling its feathers out. I too have a female Elecutus parrot which has pulled her feathers out, twice this year. Her diet is good, I moved their cage from inside to outside. Could it be stress from the change? I saw a show on animal planet that said birds will preen other birds so if a bird is alone it might over preen itself. Their suggestion was to put a feather duster in the cage with the bird. The bird will fulfill its need to pull feathers by pulling feathers from the duster. You can get feather dusters at dollar stores so it is something cheap you can try before you try getting it a companion. Go to google.com and type in "Why do parrots pluck their feathers." There are many help sites that can help you find the answer. We went through a horrible time trying to figure why our eclectus was pulling his feathers. He looked terrible. We tried everything until we read about how likely they are to be allergic to wheat and corn. Strore bought food's number one ingredient is corn. Now I make a flax seed food that he loves and all his feathers have grown in and the bald spot on his head is also gone. Here's the recipe: 2 cups flax seed, 2 cups water. Add the water to the flax seed and let sit for several minutes. The flax becomes sticky and will absorb all the water. Now I add any nuts my bird likes, a little cinnamon and some chia seed...up to 1 cup. Dried fruits can also be added. Next, pour the mixture onto a parchment covered baking sheet. Bake on a low temp (285-300) until the mixture is crunchy. I stir and flip it every once in a while. It takes about an hour. If you don't get all the moisture out it will become moldy in a plastic bag so I actually leave it on the baking sheet and in the oven and take out what I need from there. This amount will feed him for several weeks and is well worth having a pretty bird again. Plus, he loves the stuff! I have a female Eclectus parrot that pulls her feathers out. I adopted her from a loud vet clinic and I would like to see her get her beautiful feathers back. How can I help her? What are you feeding your bird? Sometimes diet is a problem. If an avian vet checks the bird and says she is healthy then there are a few things you can try. Provide lot's of stimulation for her. They do need things other than seed for their diet. My parrots eat just about everything I do, except the following which are poisonous: cherries, chocolate, avocado, caffeine, and alcohol. Don't allow a lot of dairy either. But scrambled eggs, fresh fruit, veggies, and such are a good place to start. All my birds love pizza crust. When I go grocery shopping I hit the salad bar, and get a little bit of many things for mine. They are carnivores also, so a few chunks of turkey or chicken are a nice treat. Treat your bird like she is a family member. When you have dinner, take a little bit of everything and put it in a treat dish for her. You will soon learn her likes and dislikes. Perhaps the variety will make a difference. Toys are important as well, what I like to call busy toys, things she can shred and destroy. Also try a mirror, and leaving the TV on where she can see it. I beg to differ with some of the diet advice given. I realize in the wild parrots eat nuts, seeds, etc., but a domesticated parrot does not get the same exercise, therefore diet is something that should be carefully monitored. Fruits and veggies are great as long as they are healthy. Apples, pears, peaches, etc. have natural sugar and should be given in moderation. Papaya, kiwi, and mango are the best fruits to give. Veggies are the same. Peas and corn have a lot of natural sugar. Green leafy veggies are best. Beans are high in fat so stick to green beans or sprouted beans. Chicken, turkey, and even fish are very good. Trust me I know about diet. I adopted a nine year old abused Maximilian's Pionus in January 2000 that had numerous health problems. Unfortunately, while most were treated and cured with medication she has been left with a bad liver due to the poor diet she was given. She has been on daily medication the entire time I have had her, goes to the vet every 3 months for blood tests to check her liver functions and is on a very strict diet. The first avian vet I had treated her condition differently than my current vet and I am lucky to still have her. When he started seeing her in March 2005, Xrays showed her liver to be so enlarged it had displaced all her other organs. He told me point blank that she could drop dead at any time. I followed his directions to the "t" especially diet and now he calls her the miracle bird. While her liver functions are not perfect, they are very close to normal range and the inflammation is under control. I honestly thought I was giving her a healthy diet, but he stopped everything I was doing and gave me a list of exactly what she could have. I am talking right down to the number of Harrison's High Potency coarse ground pellets she was allowed per day. As for plucking. It can be diet related, caused from bacteria or stress related. Does your bird pluck in a specific area? Does it just pluck or is it mutilating itself? Have you had the bird tested for Giardia? If it is a stress related plucking, Avian Medicine Chest has a wonderful product that does not make your bird lethargic. It's called Neuroseze. I know several people that have had wonderful results with it and their birds were not affected at all like they sometimes are by vet prescribed "downers". Sorry for being so long winded. I hope things turn around for your Ekkie. Is it a Solomons? They are so pretty and their plumage looks like velvet so I can understand your frustration. Oh another thing, does the bird get plenty of UV rays (full spectrum lighting)? UV rays are essential for the absorption of certain vitamins that are necessary for healthy plumage.